Get Out Your Earbuds! 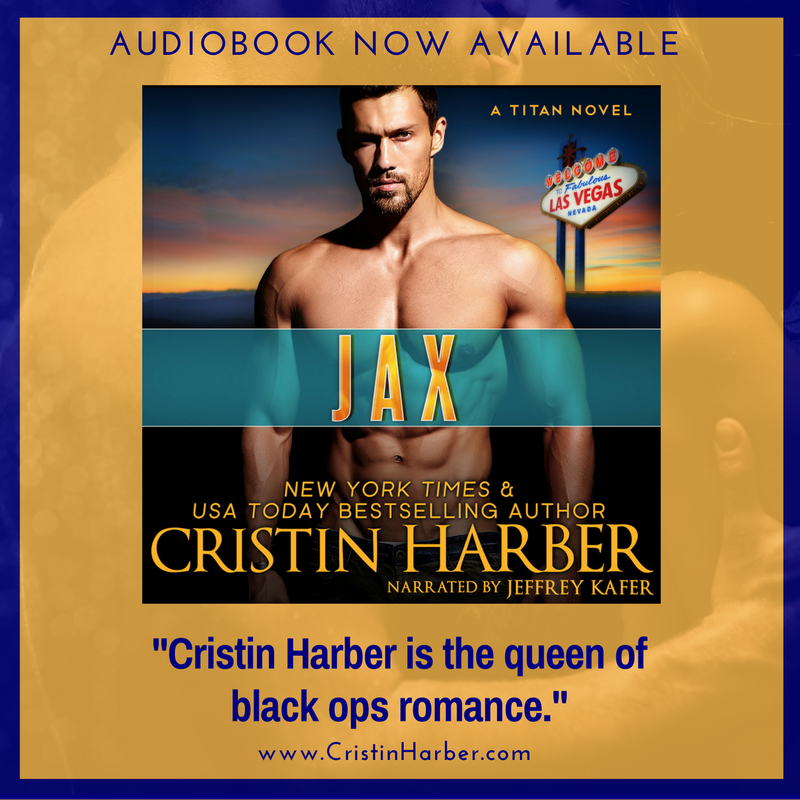 The Jax Audiobook Is Here! Ready for a steamy audiobook? The last standalone book in the Titan series is ready for your listening pleasure. You can grab the Jax audiobook at Amazon, Audible, or iTunes! Frequently asked questions and the book blurb are below. From New York Times bestseller Cristin Harber and award-winning narrator Jeffrey Kafer comes a new standalone romantic suspense novel, the JAX audiobook! Seven Blackburn is an enigma. A motorcycle club princess and the daughter of a notorious gangster. She’s a straight-shooting single mom dead set on ridding a powerful motorcycle club of their South American drug cartel connection. But not all players are ready for the game to change, including the one she can’t see: the CIA. Jax Michaelson has a bad attitude but a good shot. The former Navy SEAL has been on Titan’s problem list since he showed up for work. Call him cocky. That’s fine, because then you’d have to admit he’s the best at everything. Except diplomacy. Seven becomes an unexpected bargaining chip, and Titan is forced deeper into the seedy world drug cartel glitz. Can Jax be the hero Seven needs when a life as Mayhem motorcycle club princess backfires and her children disappear? Jax is a stand-alone romantic suspense novel by New York Times bestselling author Cristin Harber. It features characters from the Titan, Delta, and Only series, but listeners do not have to have listen to those audiobooks to enjoy this one. There’s a guaranteed happily ever after and no cliff-hanger! Enjoy! Do you have to listen to the series in order? No, you do not have to listen to any other Titan series books to enjoy this new audiobook! Who narrated the audiobook for Jax? Jeffrey Kafer! Jeff has been the voice of all Cristin Harber’s audiobooks. Can listeners watch the audiobook production? Why, yes they can! Jeffrey Kafer introduced his Audiobook Theater Live on YouTube. You can watch Jeff narrate the Jax audiobook! Is the JAX audiobook a standalone title? Yes, Jax can be enjoyed as a standalone story even though it is part of the Titan series. Titan and Delta series readers will likely enjoy appearances by their favorite characters. But this does not hinder new listeners from enjoying the audiobook. No cliffhanger! Where can the JAX audiobook be found? Amazon, Audible, and iTunes!